This, well, this has been a long time coming. Windows 10 launched officially on July 29, 2015, and with it came the new web browser to replace Internet Explorer, which was named Edge. If you go back to our Windows 10 Review, Edge brought some nice features with it, but it was really lacking in functionality at the same time. 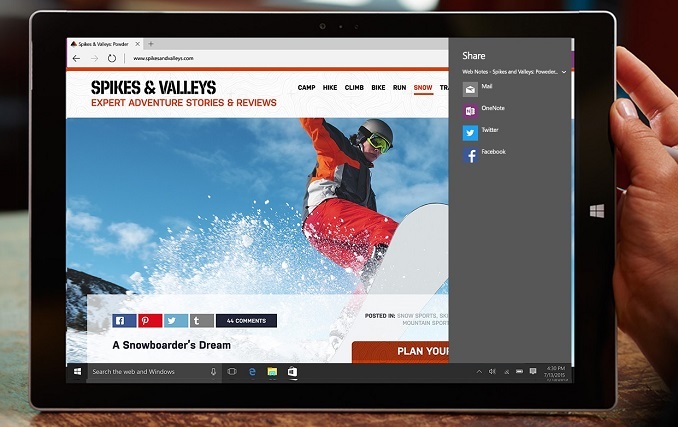 From not being able to right click and save a file (that’s fixed now) to having no ability to sync across devices (sort of fixed), Edge was an improvement over Internet Explorer and a step back at the same time. For most people, the one big issue that was missing was extension support. Internet Explorer used a plug-in model, and that was deprecated with Edge, but until today there have only been mentions of Extensions coming to Edge. After much waiting, that finally changes today. Microsoft has taken the wraps off of the feature, bringing it to the Windows Insiders in a new build which came out late today. As with most new feature additions in Windows 10, the update to Edge is made available to those in the Fast Ring first, and over time it will be deployed to the other rings, and then to all users. The Extensions were shown off at Build in 2015, so the actual coding part is known. 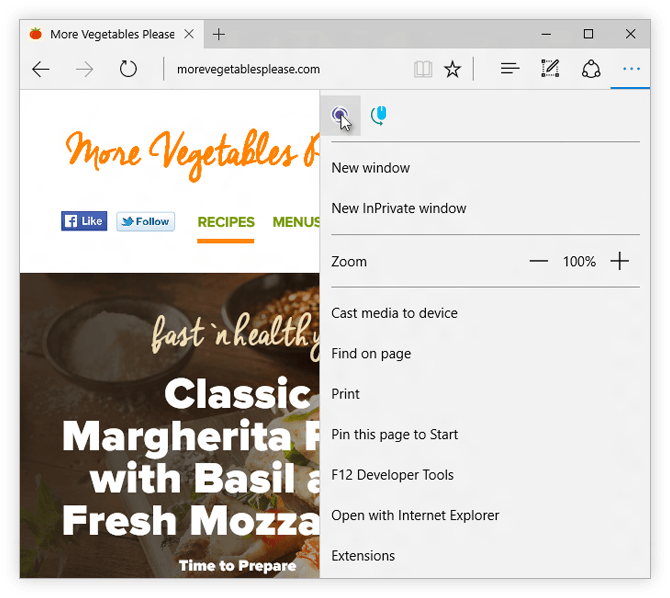 Edge extensions are very similar to Google Chrome extensions, so developers will be able to quickly port their extensions over for Edge. At the moment there are only three extensions, but expect this to increase quickly. Microsoft specifically calls out upcoming support for popular extensions such as AdBlock, AdBlock Plus, Amazon, LastPass, and Evernote. As an avid user of LastPass myself, not having it has made using Edge quite cumbersome so I look forward to the day that this arrives. For this initial build, extensions have to be sideloaded by downloading them from the site and then installing them, but as was laid out at Build last year, extensions will be added to the Windows Store to make it easier to safely install and remove extensions as needed. 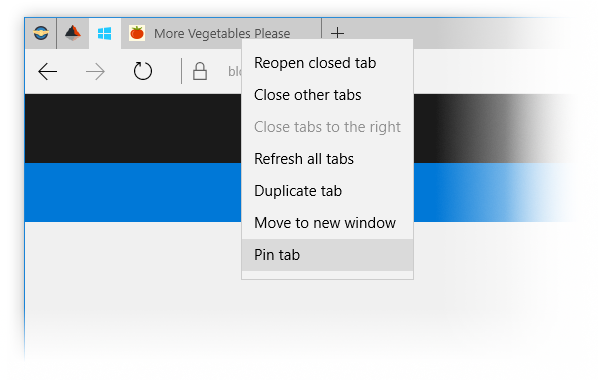 Additionally, Edge is also adding support for Pinned Tabs, which keep tabs always open and on the very left of the tab bar whenever the browser is opened. Simply right click the tab bar when on a page, and you can pin it to the side. The site title bar will be just the favicon for the site, to save space on the bar. 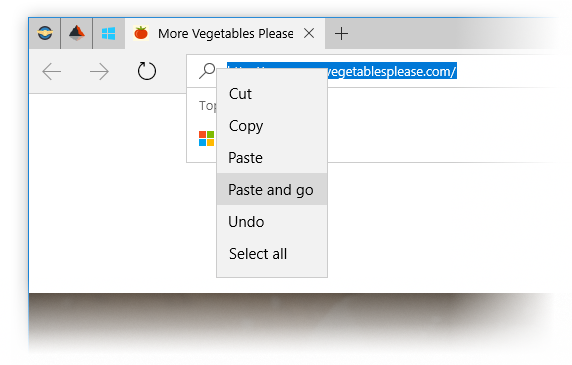 Finally, Edge in this preview build now has Paste and Go support from the context menu. I’ve heard people requesting this so I think it’s a pretty popular request. The Fast Ring has certainly become “faster” lately, with more builds coming out than ever before. Up to this point, the new feature additions have been small as Microsoft changed core support inside of Windows 10, but with the new Redstone release set for the next couple of months, expect more features to be added in the upcoming builds. Hopefully they get these features ironed out in time for Windows 10 to ship his Fall. It is the default OS browser now, so it should be working as intended before it is used by the mainstream public. If you bought a car today and it did not have air conditioning, but the manufacturer says it will be added at a "later date" would you take that manufacturer seriously? If they deprecated the old model, which wasn't great but at least had air conditioning, and made the new model the default would you still take them seriously? Oh man you're so right it's blowing my mind. It's exactly like a car where they have to install a compressor, evaporator, condenser, A/C lines, etc at great cost fleetwide. Perfect analogy. Genius level. Just like current web-centric in-development software where new features are never added even though they actually are all the time. I mean take another browser like Chrome. They never add new features to that right?